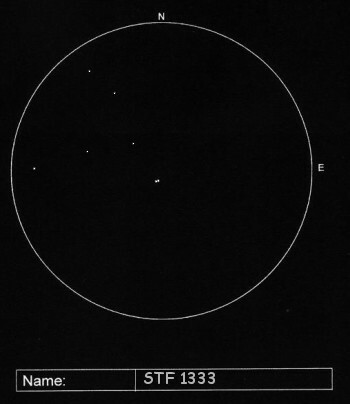 As the rating depends on the instrument used for observation, the scope for which this rating is given is mentioned. 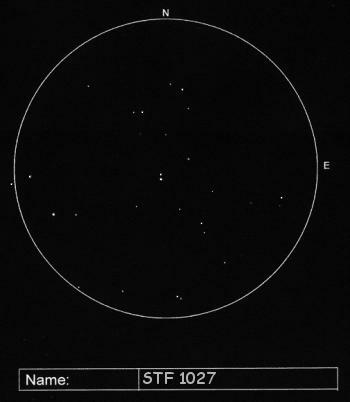 LX10 Struve 79 And 6 - 6.8 7.8" 01:00 +44:42 . 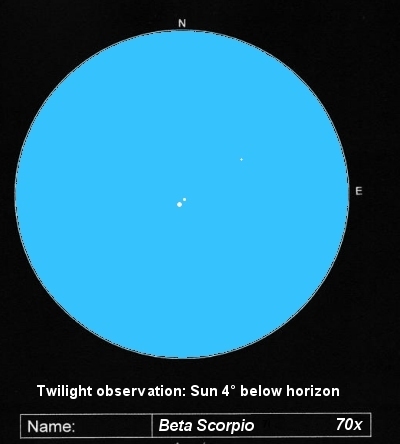 Cas 7.6 - 8.7 58" 00:01 +60:21 Deep-orange and blue. Striking colors and nice view with low power (20x). Colors are even more striking with larger scope (LX10), but then separation is too large and rating drops to 2. CG11 Delta Cep Cep 4.1 - 6.3 41" 22:29 +58:30 A bright and easy double with a yellow primary, in a very rich field. CG11 Omicron-1 Cyg Cyg 3.8 - 7 107" 20:14 +46:44 A very wide double, best seen with lowest possible magnification. Very beautiful because of the deep-yellow color of A and the very rich field. CG11 South 548 Gem 6.8 - 8.9 40" 07:28 +22:09 Very nice colors, deep-yellow and blue! CG11 Alpha Gem Gem 1.9 - 2.9 3" 07:35 +31:53 "Castor"
CG11 95 Her Her 5.1 - 5.2 6.5" 18:02 +21:36 A wonderful double when using low power. The stars are yellow and white. CG11 Beta Mon Mon 4.5 - 5.2 - 6 7.4" - 10" 06:29 -07:01 Three white stars. B and C are only 2.8" apart. 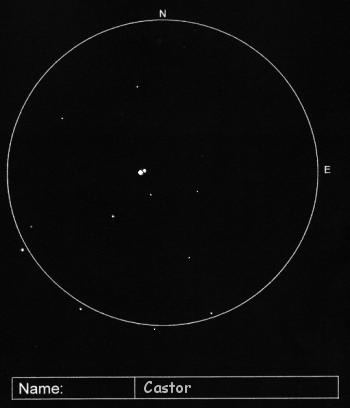 AT80 Struve 747 Ori 4.8 - 5.7 36" 05:35 -06:01 Two white stars in a very rich field. 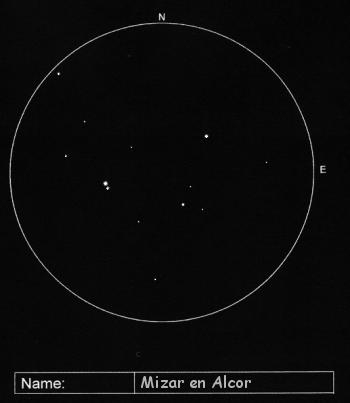 CG11 Lambda Ori Ori 3.7 - 5.6 - 11 4.4" - 29" 05:35 +09:56 "Meissa"
CG11 Sigma Ori Ori 4 - 6.5 - 7.5 43" - 13" 05:39 -02:35 . Per 2.4 - 8.4 8.9" 02:51 +55:53 . .
GS80 Psi-1 Psc Psc 5.5 - 5.8 30" 01:06 +21:28 A beautiful bright double for small instruments. Both stars white. CG11 Beta Sco Sco 2.9 - 5.1 14" 16:05 -19:48 "Graffias"
Bino Theta Ser Ser 4.5 - 5.4 22" 18:56 +04:11 "Alya"
CG11 Struve 742 Tau 7.2 - 7.8 3.9" 05:36 +21:59 . 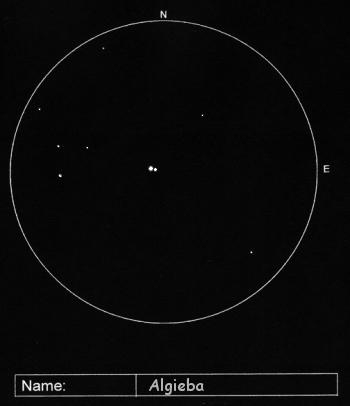 CG11 Struve 494 Tau 6.9 - 7.0 5.3" 04:09 +23:06 Two yellow stars of almost equal brightness. CG11 Struve 427 Tau 6.9 - 8.1 6.8" 03:41 +28:46 Beautiful colorful double, yellow - bluewhite, in rich field. MK67 Alpha UMi UMi 2 - 9 18" 02:31 +89:15 "Polaris" - Primary is bright yellow, secondary is a beautiful small pinpoint next to it. Because of the large difference in magnitudes a good test for small scopes. In mediocre seeing the Swarovski shows the secondary at 40x. CG11 Struve 1719 Vir 7.7 - 8.2 8" 13:07 +00:34 .